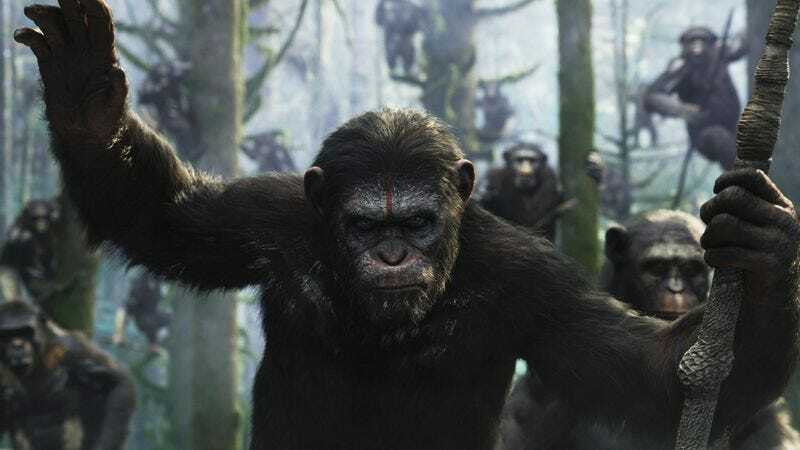 Caesar and his ape army are back in the latest Planet Of The Apes installment, Dawn Of The Planet Of The Apes. As the human race struggles to rebuild after a devastating viral outbreak a decade earlier, the growing tension between horse-riding apes and the remaining humans is palpable. Is war imminent? Can humans and apes find common ground, possibly through our shared love of horses? Why did we ever trust James Franco with important genetic research? The film opens nationwide July 11, but The A.V. Club has an opportunity for you to attend an early screening on July 8, here in Chicago. Simply follow the link here, and enter the RSVP code AVCLUBAEZ1. Thirty lucky participants will receive passes good for two. Remember, seating is first come, first serve; so arrive early! A synopsis and trailer for the film can be found below.